I do not understand quantum chromodynamics. Therefore, I do not pretend to understand quantum chromodynamics, and I do not write about the subject. Would that all the people, who do not understand the differences between Monetary Sovereignty and monetary non-sovereignty, abstained from writing about the subject. Unfortunately, many (most?) articles about federal finance reveal the authors’ abysmal understanding. The U.S. government and others (Canada, Japan, the UK, Australia, et al) are Monetarily Sovereign. They create their own sovereign currency and pay their debts using that sovereign currency. By contrast, cities, counties, states, euro nations, businesses, you, and I are monetarily non-sovereign. We do not have a sovereign currency with which to pay our debts. Unlike the U.S. government, you and I and the other non-sovereign entities can run short of whatever currency we use for bill-paying. Writers, who do not account for the difference, wrongly seem to believe U.S. government finances are similar to monetarily non-sovereign entities. He was wrong. The U.S. government is not “just like families.” Federal finances are nothing like family finances. The President spoke out of ignorance or deceit, I don’t know which. Many speakers and writers do the same. John Steele Gordon is one such writer. Here are excerpts from his article that appeared in Commentary. John Steele Gordon is an economic historian and the author of, among other works, An Empire of Wealth:The Epic History of American Economic Power. He was educated at Millbrook School and Vanderbilt University, graduating with a B.A. in history in 1966. 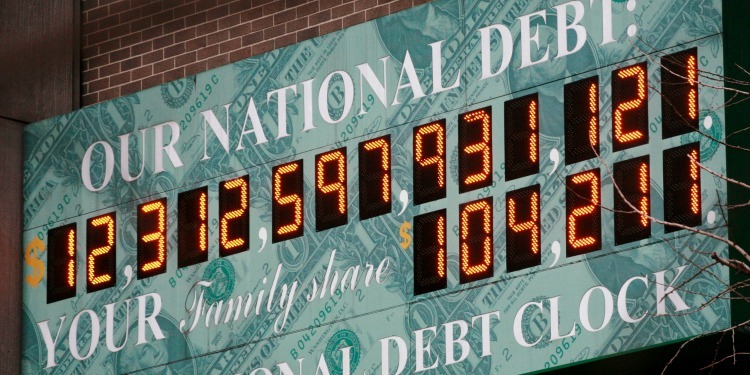 The famous “debt clock” that wrongly implies you owe the federal debt. Someone in the 19th century said that there are three forms of lying: lies, damned lies, and statistics. As you will see, Mr. Gordon will provide excellent examples either of his own mendacity or his pure ignorance of the subject. In our previous post, “The CRFB myth machine keeps on rolling,“ I assumed the Committee for a Responsible Federal Budget (CRFB) was deliberately deceptive. In today’s post, I wonder whether Mr. Gordon, a Bachelor of Arts in history, simply never learned about federal finance. Including that notorious and misleading debt clock as a lead to his article, is only the beginning of his article’s wrongheadedness. In it, he compared the deficits run up by each Democratic and Republican administration from Jimmy Carter on to the present with the GDP of that time. We have written at length about why high Debt/GDP and the Deficit/GDP ratios constitute no threat to a Monetarily Sovereign entity, the U .S. government. These ratios are presented with the implications that a) the federal government can’t afford to service some level of deficit or debt, and b) that taxpayers will have to bear the burden. As Greenspan, Bernanke, and the StL Fed say, the federal government can pay any bills by “printing” dollars, not by collecting taxes. Clearly, you taxpayers and your grandchildren will not be burdened (as some pundits claim). Whatever his methodology, Leonhardt was comparing apples and oranges. Ah, the irony of the apples/oranges analogy, since there can be a no better example of that fruit salad than Debt and GDP, two unrelated, completely non-comparable figures. “Debt” equals the deficit total over many years. GDP is a one-year measure of spending in America — federal, non-federal and foreign. A high Debt (or Deficit) / GDP ratio merely implies the financial contribution the federal government makes to our economy. The ratio says nothing about affordability, the need for taxes, economic growth or any other important measure. It was not Bill Clinton who slew the deficit dragon in the 1990’s but the Congress, which the public transferred to Republican control in 1994 for the first time in 40 years following an outcry over Democratic profligacy. Federal Spending and Non-federal Spending both rely on the dollars created via federal deficit spending. The Republican Congress increased spending by a mere 18 percent between 1995 and 2000, while the roaring economy increased tax revenues by 51 percent. Nor did Leonhardt take into account the phony accounting the federal government uses to obscure reality. Officially, we ran surpluses (meaning, by definition, that income exceeded outgo) in 1998, 1999, 2000, and 2001. But the national debt went up, not down, in each of those four years. The blue line (Total Debt) includes internal debt (dollars federal agencies owe to each other). The red line is the total of T-securities owned by the U.S. and other economies. The national “debt” went up only if one includes the internal debt that federal agencies owe each other — i.e. what the right pocket owes the left pocket. Surpluses however, refer only to external debt — dollars flowing from the federal government into the economy. The real federal debt went down from 1997 through 2000. Predictably, the surpluses beginning in 1997 led to the recession of 2001, which was cured by deficit spending. Nor did Leonhardt take into account the fact that recessions cause government spending to go up and government revenues to go down—something quite beyond the control of Congress or the President. Recessions don’t “cause” government spending to go up. Deficit spending, which pumps dollars into the economy, is the primary method governments use to cure recessions. And to say that government deficit spending is “quite beyond the control of Congress or the President,” goes well beyond ordinary ignorance, into the land of the blind. But in the last forty years, the only time the federal government made a serious, sustained effort to rein in the deficit was when a Republican Congress was writing the checks. In fact, Democrat Bill Clinton was President, and though Clinton often boasts about his surpluses, “reining in the deficit” caused a recession, which was cured by deficit spending. In summary, I don’t know John Steele Gordon. I don’t know whether his wholly wrong article was designed to mislead or merely was written out of ignorance. Either way, the effect is the same: Deception. A public that already does not understand Monetary Sovereignty and federal finances, is further vaccinated by complete misunderstanding. And that always has negative consequences.